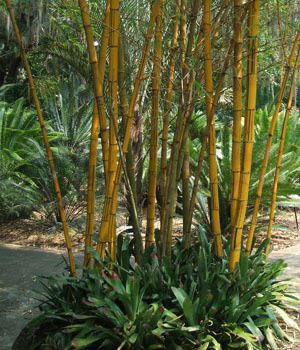 Bambusa vulgaris Vittata, common names: Hawaiian Stripe Bamboo, Painted Bamboo, Hawaiian Golden Bamboo, is the most popular and recognizable ornamental bamboo in Hawaii. It has bright golden yellow culms with vertical green stripes in random widths. This is a highly decorative and desirable bamboo that prefers full sun to put on its best display. One of the most drought sensitive bamboos that will slightly shrivel its leaves when it needs watered. It does not like its roots to dry out. On a personal note: mine in zone 9A has had no problems other than very slow growth. It rarely puts out a new culm, but I'm sure it would do much better a little further south.